Queen Victoria was only 18 when she came to the throne and she had a lot to learn. Her reign had a rocky start. She thought that, as queen, she could do as she liked, and she quickly had to learn that she couldn't. Queen Victoria's reign spanned sixty four years, from 1837 - 1901. Where was Queen Victoria born? What name was she christened as? Who did Queen Victoria marry and when? How long exactly did Queen Victoria reign? Why did Queen Victoria wear black? Where did Queen Victoria live? What hobbies did Queen Victoria have? How did Britain change whilst Victoria was Queen? When did Queen Victoria die? Who became the next King or Queen after Victoria? What were Queen Victoria's children called? How many children did Victoria have? 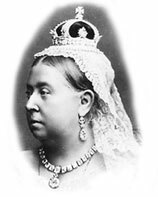 Victoria was Queen of the United Kingdom of Great Britain and Ireland (1837-1901) and empress of India (1876-1901). Her reign was the longest of any monarch in British history and came to be known as the Victorian era. Victoria was the only child of Prince Edward (Duke of Kent) and Princess Victoria Mary Louisa of Saxe-Coburg-Saalfeld. Prince Edward (1767-1820) was the fourth son of King George lll. Find out more about Victoria's family tree. Both Queen Elizabeth, the Queen today, and her consort (as her husband is known), the Duke of Edinburgh, are great-great-grandchildren of Queen Victoria. Queen Victoria was born on the 24 May in 1819. Her father died eight months after she was born. Victoria was born at Kensington Palace, London. What name was Victoria christened as? Victoria was christened 'Alexandrina Victoria'. However, from birth she was formally addressed as Her Royal Highness Princess Victoria of Kent. Queen Victoria's family nickname was 'Drina'. Victoria was part of a family of Germans, mainly called George, who came from Hanover. Click here to find out about Victoria's family. Victoria's first language was German. At three years old she learnt to speak English and French. Later she learnt to speak Hindustani because she was ruler of India as well. Victoria didn't go to school. She was taught at home. As well as learning languages, Victoria studied history, geography, and the Bible. She was taught how to play the piano and learned how to paint, a hobby that she enjoyed into her 60s. Queen Victoria came to the throne when she was only 18 years of age on June 20, 1837. Her coronation was a year later on 28 June 1838. At the age of 21, Victoria married her cousin, Albert of Saxe-Coburg Gotha, a German Prince. They married on the 10th February 1840 at the Chapel Royal in St. James's Palace. 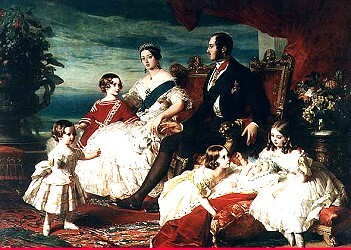 Victoria had nine children, 40 grand-children and 37 great-grandchildren, scattered all over Europe. Most of Queen Victoria's children married into other royal families of Europe. Queen Victoria reigned for exactly sixty-three years, seven months, and two days (June 20, 1837 - January 22, 1901). Queen Victoria is our longest ever serving monarch. How old was Victoria when she inherited the throne? She inherited the throne at the age of eighteen, upon the death of her uncle William IV who had no legitimate children (children born to married parents). 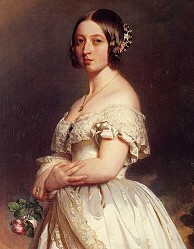 Her husband Albert died in 1861 at the young age of 42. She mourned his death for almost 10 years. For the rest of her reign she wore black. Queen Victoria had many homes. She lived in Buckingham Palace, Windsor Castle, Osborne House (Isle of Wight) and Balmoral Castle. Queen Victoria was the first monarch to live in Buckingham Palace. Victoria was known as the "Grandmother of Europe" because many of her children and grandchildren married into the royal families of other European countries. Queen Victoria loved singing and she enjoyed painting and drawing. She loved going to the opera. Britain became the most powerful country in the world, with the largest empire that had ever existed, ruling a quarter of the world's population. The number of people living in Britain more than doubled, causing a huge demand for food, clothes and housing. Railways, originally built to transport goods, meant people could travel easily around the country for the first time. Queen Victoria died on 22 January, 1901 at Osborne House on the Isle of Wight. She was 81. Queen Victoria was survived by 6 children, 40 grandchildren and 37 great-grandchildren, including four future sovereigns of England: Edward VII, George V, Edward VIII and George VI. She is buried in a mausoleum at Frogmore, Windsor. Queen Victoria was succeeded by her eldest son, Albert Edward, Prince of Wales. He became King Edward VII. Queen Victoria had 9 children.